Although considered Clinton's closest ally, British Prime Minister Tony Blair grew irritated with his indecisiveness over Kosovo. LONDON, England (CNN) -- As Bill Clinton prepares to leave the White House, the world leaders with whom he dealt will likely remember him more as a politician than as a president. A man who repositions his party and wins two elections doesn't lack the respect of his peers for that, whatever their reservations over his personal morals. Former British Prime Minister John Major recalled in his memoirs that Clinton was the most political head of government with whom he ever did business. "When we were in discussions together I could see, even feel, him calculating the political angle," Major wrote. "I have seen him size up the people he is with, tune into their wavelength and choose his approach. It is as instinctive to him as breathing. He never stops campaigning." Most leaders envied Bill Clinton's ability to work a crowd, his capacity for convincing an audience of thousands that he was talking to each one personally. Those who attended summits and conferences with him testify that he knew how to wield presidential clout. One British prime minister's aide said: "He was always able to cut through the bull**** of what people had to say for political reasons." But fellow leaders gave credit for the booming American economy under his presidency not to Clinton's budget wizardry, but to Federal Reserve Chairman Alan Greenspan's wisdom. And most confess to some disappointment with Clinton's overall record on international affairs. 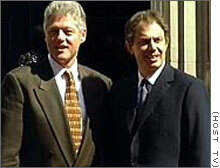 Even his closest ally, Britain's New Labour Prime Minister Tony Blair, who shared Clinton's taste for Third Way policy-wonking, grew irritated with Clinton over the Kosovo war. Like other European leaders, Blair was frustrated by the president's unwillingness, without focus group approval, to signal a commitment to use ground troops. Although he got along with French President Jacques Chirac, the French scorned Clinton's unwillingness to adopt policies that might make him enemies. With Cold War certainties gone, Clinton saw an attempt, not always successful, to define new rules for a game in which voter opinion had grown more fickle and Congress readier to intervene. He came to office as an innocent in international relations. Early in the Balkans conflict he sided clumsily, and simplistically in many European eyes, with the Bosnian Muslims. In other circumstances, he appeared to some world leaders that he was learning as he went along. That was particularly true in the Haiti situation. Some European leaders now concede, however, that Clinton's clashes with them on trade policy and the GATT round in 1993-94 (which led to the creation of the World Trade Organization) were not all because of White House intransigence. They were to blame, too. If there has been a hint of desperation about Clinton's final efforts to secure a Middle East peace deal -- to have something in the history books to balance against the Lewinsky affair -- most European politicians admire the energy the president has devoted to that cause. Clinton himself declared, "Ask me to draw a map of the Middle East in my sleep and I could do it," and they acknowledged his grasp of the issues as well as his stamina. Before leaving office in 1999, Russian President Boris Yeltsin shared a warm relationship with Clinton despite their differences over Kosovo and Russia's war with Chechnya. So long as Boris Yeltsin endured as Russian president, Clinton earned report card ticks on relations with Russia. The Boris and Bill Show worked, up to a point. 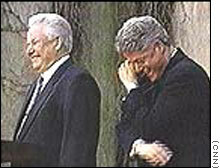 Yeltsin paid tribute to Clinton's toughness and decisiveness. But Clinton had no success trying to persuade Yeltsin's hand-picked successor, Vladimir Putin, to accept a new defense deal that would involve changes to the ABM treaty, and so he leaves the hard decisions on national missile defense to his successors. Clinton became genuinely friendly with Tony Blair, who modeled much of his New Labour approach on Clinton's "New Democrats." Those close to the British prime minister pay tribute to Clinton's grasp of policy detail. One Downing Street insider declares: "He vacuumed up policy obsessively. He knew a huge amount about French and German politics too." One clear success was on Northern Ireland. Both London and Dublin governments used Clinton to make phone calls to key participants at crucial stages when the peace process was in danger. Clinton was always ready to become involved in Northern Ireland when he could be of use, and he helped to close the deal on the Good Friday Agreement. He was a big hit on his three visits there, helping to convince local people that peace was possible. Many of them hope that he will stay involved.